Because of their biological relevance, cyclic β-amino acids have generated increasing interest and had significant impact in drug research over the past two decades. Their preparation and further functionalization towards new types of molecular entities have received large interest in synthetic and medicinal chemistry. Various types of metathesis reactions, such as ring-opening (ROM), ring-closing (RCM), or cross metathesis (CM) are used widely for access to either alicyclic β-amino acids or other densely functionalized derivatives of this group of compounds. 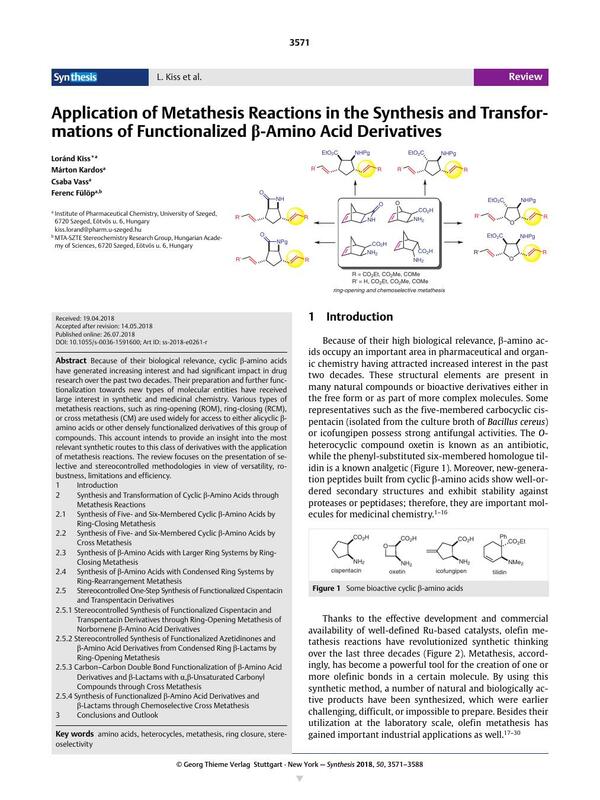 This account intends to provide an insight into the most relevant synthetic routes to this class of derivatives with the application of metathesis reactions. The review focuses on the presentation of selective and stereocontrolled methodologies in view of versatility, robustness, limitations and efficiency.